The Gasparilla Island Light was originally built in 1885 and served as a range light in Delaware. It was decommissioned in 1918, disassembled in 1921, and put back together again in 1927 on Gasparilla Island. 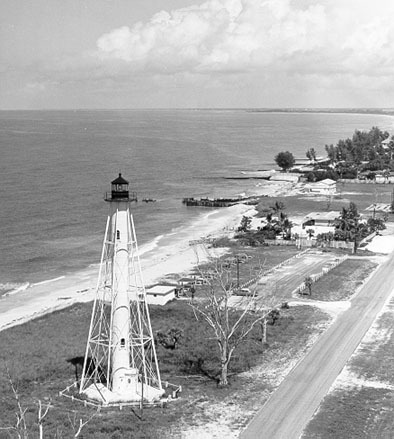 It began service in 1932 as the rear entrance range light for Port Boca Grande. The front entrance range light was about one mile offshore in the Gulf of Mexico. The two lights flashed at different rates. When the range lights lined up, the ship's navigator knew it was the exact time to turn into Boca Grande Pass. The front range light was removed years ago, but the rear range light remains in service today as the Gasparilla Island Light. The light can be viewed from the adjacent road and is north of Gasparilla Island State Park, home to the Port Boca Grande Lighthouse. The names and locations of the two different lighthouses on Gasparilla Island have confused visitors for years. We hope this explanation clears things up.